One of the things I am looking forward to most about this season is that it is completely up in the air. In a somewhat down Big EAST, Marquette could legitimately finish anywhere from 4th to 14th. I'm particularly excited to see how all of the various new players will perform this season, partially for the same reason. No one knows what to expect, especially with such a huge influx of new talent. The question of what we expect from the new players drove me to take a look at Top 100 recruits in the Big East, and how they performed in their first year. Thanks to the help from bma and statsheet.com, I tracked down every Top 100 recruit for the Big EAST from 2005 through last year. Because there were a number of puts and takes, this list may have some inaccuracies. Over this four year period, there were 89 players listed as Top 100 by one recruiting service or another. In somewhat surprising information, Rutgers had six Top 100 players. It's important to note that ten of the players in this pool (including Mbakwe) end up as incompletes due to injuries or lack of production. I actually consider this somewhat good news, because I would have expected the percentage to be a lot higher. Over this period, how did these players perform their first year on the team? Somewhat surprisingly, the average first year player, even as a Top 100 recruit, was... average. Seriously, the average of the remaining 79 players was an offensive rating of 100.4 and a usage of 20.6%. It doesn't get much more average than that. 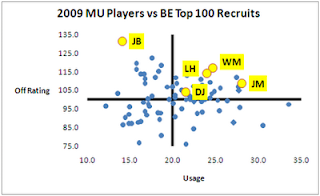 The first point that this brings up is that even Top 100 recruits are most likely not very efficient offensive players. In fact, 70% of the Top 100 recruits in their first year had an offensive rating of 105 or less. Here is the breakdown of all of the players. As you can see, I've broken down the players into four quadrants of Stud, Role Player, Ball Hog, and Non-Factor. They are surprisingly consistent across categories (20 Studs, 19 Role Players, 17 Ball Hogs, and 23 Non-Factors. Ball Hog - A player that is below average offensively but above average in terms of usage. Guys in this category include Deonta Vaughn, Wilson Chandler, Chris Wright, Derrick Caracter, Mike Rosario, and Paul Harris. These guys put up points but hurt the team. Non-Factors - Below average offensively and in terms of usage. Many of these players prompted a "who?" when I saw their names. Sometimes the players just need time (like Thabeet), but often, these guys simply become role players later, like Andre McGee or Reggie Redding. Or they don't contribute at all later. Again, this is a view of how Top 100 players perform in their first year. So the second point is that there is a pretty even split as to whether or not these players will be true studs, simple role players, ball hogs, or even just a non-factor on offense. I'm sure you'll note that I didn't mention any Marquette players in the list above. How did they do in their first year? James was a legit stud his first year, with an offensive rating of 104.9 and a usage of 27.7%. McNeal was a true ball-hog that first year, consuming almost the same amount of possessions (27.1%) with an offensive rating of 87.7. woof. Lazar and Wesley were basically average players (100.5, 99.1, respectively) with slightly above average usage (22.5% each). Here is how last year's top five players (JB = Jimmy Butler) would have stacked up against the same list of first year players. The Big Four were all studs, with offensive ratings and usage above average. It's no surprise that players improve over time. So even if the guys joining the team next year are sub-par with their offensive ratings, they can still get a lot better. That's the good news. 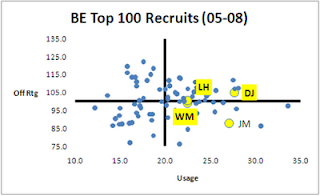 I previously mentioned that 70% of top 100 recruits have an offensive rating of 105 or below. Well, Marquette had four of its top five players above an offensive rating of 105. The only one of the top five producers not above 105? James, who was right there at 104.0. 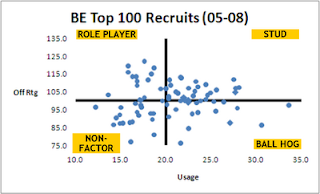 Heck... even Dwight Burke would have qualified as a solid role player (ORtg 109.9, usage of 9.9%). To put it another way, Marquette was a very good offensive team last year. If you are expecting a team that looks nearly as good offensively on the court as last year's team, well... that's the bad news. Even Top 100 recruits rarely match the level of production we saw last year. Barring injury, Erik Williams, Junior Cadougan, and Jeronne Maymon will receive somewhere close to the average number of possessions. The number of possessions they receive will probably be the most important aspect of how they perform in their first year and there are plenty of possessions to go around. While it's almost certain that their offensive skills will be limited, there appears to be a chance that one (or more) of them will shine as a true first year stud. However, it also appears that one (or more) of them may end up as a ball hog. Regardless, even if these highly touted recruits struggle offensively, we should expect to see them grow into more offensively efficient players in subsequent years. Don't be too hard on yourself for comparing team offensive efficiency vs. individual offensive rating. The non-mathematical definition of off. rating is "points produced per 100 possessions," so that, if the underlying estimates and assumptions of the math for off. ratings are correct, the usage-weighted average of individual off. ratings should equal the team off. efficiency. Of course, this only works if you're using raw (unadjusted) off. efficiencies, since off. ratings are not weighted for competition. The team off. efficiencies normally quoted from KenPom.com are adjusted. E.g., Marquette's 2009 raw & adj. off. efficiencies are 113.0 and 117.5. I enjoyed the post Rob, one of the better efforts I've read over the past 2+ months. I was curious to know where some of the Villanova players placed on the grid.